Home / Eco / #StopFracking: Solidarity with #Unistoten land defenders! 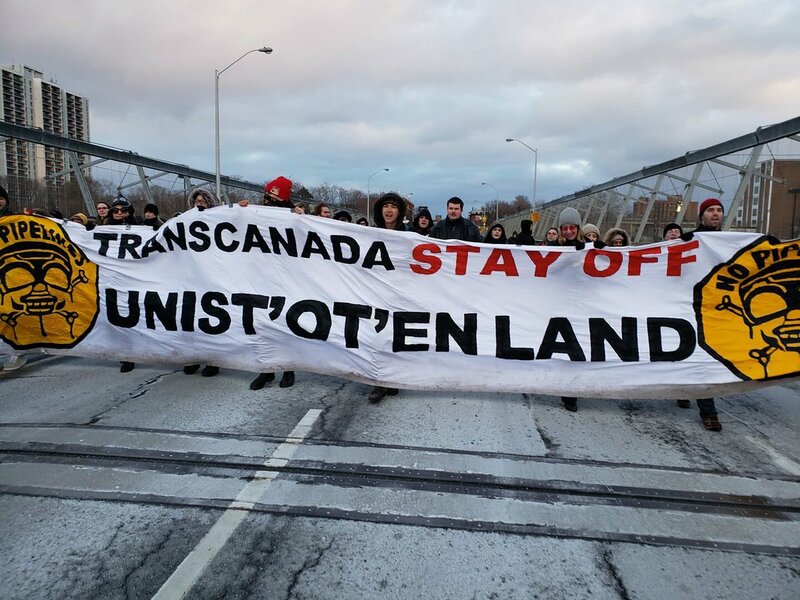 #StopFracking: Solidarity with #Unistoten land defenders! Originally published by Submedia and Wet’suwet’en Access Point on Gidumt’en Territory Facebook page. Video below: Molly Wickham, Gitdimt’en spokesperson provides a detailed account of the police raid and arrests (January 9, 2019). RCMP are on the move again this morning toward Unistot’en camp with this “peacekeeping” device. They spent yesterday clearing the road between the Gitdimt’en and Unistot’en checkpoints and made it within approximately 10 km of the bridge. Yesterday, jet boats had been passing along Wedzin kwa (Morice River) which is the only other access to this remote camp. Locals may show their solidarity by attending the Wet’suwet’en Unity Fire at 27 km on the Morice Forest Service Road. This is outside the injunction area so there is no risk of arrest, however it is still advised to not bring children. The RCMP have their inclusion zone blockade set up about 100 meters away. Note that this is a remote location and the temperatures are well below freezing so come prepared. That is, dress in very warm layers, bring food, water and a chair, have an appropriate vehicle for backroad winter driving, carpools and a CB radio is recommended. If you are able, bring firewood and snacks/drinks to share. There is no cell service after the 7 km mark. Follow Twitter hashtags #wetsuwetenstrong and #Unistoten for updates. Support our work on the Enough is Enough blog and the Enough is Enough Info-Café. You can do that with a donation here, or by ordering stickers, posters, t-shirts , hoodies or one of the other items here or click at the image below.